With Con Season now firmly upon us, we have a few things that will help our first time Con goers (it might also help those of us who are a dab hand at these). These are a few things that we have tested out during our times at cons, and we’ve tried to be as comprehensive as possible going from packing for out of towners, to what you should ABSOLUTELY pack in your Con Bag. Is your passport up to date? Remember for travelling, it’s best to have 3 months left on your passport before it expires. If you are in the 3 months, it might be time to find your nearest passport office to get it renewed before you fly out. There would be nothing worse than turning up at the airport packed and excited to go sit in on panels for some of your favorite celebs only for the airline to refuse you entry to your flight. If you are travelling, make sure that you check to see if the country you are travelling to requires you to have a visitors Visa. The United States requires non-citizens of The US and Canada to have an ESTA, and Canada now requires you to have an ETA. Make sure that you have one sorted a couple of days before you fly. The cost for these is usually minimal ($14 USD for the ESTA and $7 CAD for the ETA), and this should help make your trip quicker. 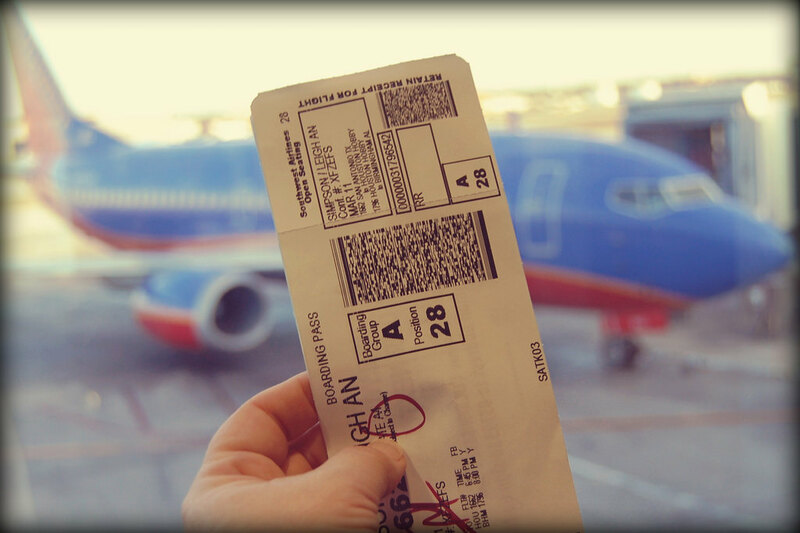 Before you leave for the airport (or to go to the venue), make sure that you have all your Airline and Con tickets printed out and in your Con Bag. I know it sounds a bit stupid to write this down, but in all seriousness, the amount of times I have left the house without my tickets for a concert or show is unbelievable. In this modern age, having a QR code on your phone is sometimes enough, but I’m old fashioned, and I like having a physical piece of paper in my hand to prove to myself that I actually have remembered them. A couple of weeks before the con, keep an eye out on social media and the Con website. This is when the usually post the schedule of then the panels are and times for photo ops and autographs. You don’t want to miss your photo op because you were busy in a panel, or miss a panel you really wanted to go to because you were busy buying lunch. Preparation for a time line is KEY for Cons! The thing that I do is to print out a copy of the schedule This will let me highlight the panels I want to see, and then see if there is any conflicts to prioritize panels. Use whichever method works for you. I’m a very visual person and need to see things highlighted before I create a schedule that works for me. No one really has time to wait around in baggage claim if your travelling to a Con for a couple of nights before flying back home again in time for work the next day, and who really wants to pay a crazy amount of money for a checked bag ($50 and sometimes more!) when you could be using your hard earned cash for those all important photo ops and merch purchases in the Artist Alleys. I’ve put together a quick checklist of all the things I am planning on packing for my upcoming trip to Las Vegas for ClexaCon. Maybe this will help some of you, maybe it wont, but I am a HUGE planner for trips and like to have lists for everything I am packing. For this trip, I have even went so far as to buy packing cubes to take my organization to the next level. When you are packing, it’s always good to remember that you will be moving a lot and will be standing in lines A LOT! With this in mind, make sure you pack a pair of comfortable shoes. For this trip, I am going with my favorite sneakers that I wear pretty much every day. This list does not include what I am wearing to the Airport (some of which will be re-worn throughout the trip) and I have placed toiletries in a separate section as it is easy enough to buy them cheap in CVS and will save on space in your case. I usually always make sure that I have a sweater on me as well. Those convention halls can get damn cold when they crank the A/C. This year I have went with the mother of all sweaters…it’s THE SWEATER from Supergirl. You know the one. Season 3, Episode 5. Yup! I got the Lena Luthor Sweater! I just love this sweater and I wear it pretty much every day and is it really an article written by Christine where she does not get in a mention of Katie McGrath or Wynonna Earp or Supergirl? I don’t think so! For all of you who don’t know which sweater it is, I am here to educate you. This is the sweater I’m wearing in my bio picture, just so you know. 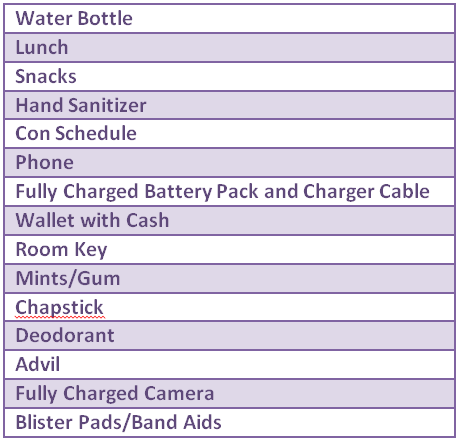 This list is in no way comprehensive, but after going to a few cons now, I think I have the Con Bag down. If you have anything to add, please let us know! Hit us up in the comments with what you put in your Con Bag that maybe we forgot! Previous Post You did what to a Ninja Assassin? Next Post The Danvers Sisters are #SisterGoals!